A very long and hot summer produced a very large and ripe crop of grapes with great acidity and alcohol levels, despite some early frost damage in April. Fortunately at Chez Poodle we had bought a number of bottles at release and carefully stored them at 55 degrees Farenheit waiting for them to mature, and a chance to share them with friends. The only additional wine was a Pol Roger Chardonnay (a Blanc de blancs) the Spaniard had bought at auction. Before we dive into notes I’ll mention there are no scores since we were having too much fun to be “numerical” - although they were ALL 90+ point wines. My Wine of The Night was the Krug 1990 – wow. Lots of wow wines here. And EVERY wine was distinctive - as I saw over and over, when handed a glass blind, I could immediately tell you which wine it was. And I do not claim to have a fantastic memory nor a gifted palate! The only one slightly past its prime, just a hair to most of our tastes, was surprising the 1990 La Grande Dame, which was STILL damn good. No, make that great. Most of these wines are still quite young, and I wish I had enough bottles to redo this tasting in 5, 10, 15, 20 and more years from now. Nov, 2013, 23 years later. Obviously I like 23 year olds! Dom Perignon 1990 – this was no one’s favorite at first, but it certainly opened up and blossomed with air. It just may be the youngest of the group. Lightest in color, slightly reductive nose, unique and off dry at first. A slightly maritime, seashell nose. With time, it was buttery and flowery, while quite dry. Delicate grapefruit without the acidity. Excellent mouthfeel. One of our group has a mag or two of this stashed away for the distant future. Cuvee William Deutz 1990 – together with the Dom, I’ve probably drank bucket loads of this over the years. The nose was hazelnut, a little menthol, perhaps a hint of chocolate covered orange, and a similar slightly maritime, seashell quality like the Dom. It was delicious, mouthfilling, and very fresh with lots of fruits including sweet oranges and tangerines. A mag of this is hidden away for the future as well! This had a slight Chablis like character, and the nose exhibiting seashells, a melody of sweetbreads (as in breads that are sweet, not organs), custard, and minerals. Sweet, with white and slightly pink fruits. Every sip got better and better. Wish there was more to drink in the future. Pol Roger 1990 – the only one not bought on release. This was just delicious despite the brief notes below. When young, this wine is a bit sweeter on the palate than I prefer. No complaints here however! The nose had very slight oxidation, a little cider, and lots of chalk tones. It was sweet, but not remotely too sweet: just perfect. Drank well! Fresh cut apples and just delicious. La Grande Dame 1990 – Damn good but slightly past its prime to my palate. I have had other bottles recently that were similar. The nose had spicy apples and cinnamon. It was sweet, toasty, and delicious. 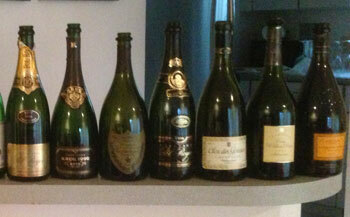 Krug 1990 – yes, my wine of the night, but all of these were great! An aristocratic Burgundian nose with a broad array of tropical fruits underneath. Explosive in the mouth! My scribbled notes read “True Love!” So smooth and lifefilling. A citrus melody, vanila, light coffee notes on the end. Winston Churchill 1990 – our second Pol Roger wine in the lineup. The nose was closed at first. Then flinty and chalky. On the palate, gentle white fruits initially, building enormously in power as it breathed. Drinking wonderfully, but quite young indeed. The night was still young, so we moved on to 1970s and 80s Riojas, supplied, no surprise, by the Spaniard. No notes, just fun.